Obviously perturbed, Reigle filed a complaint with the Michigan Public Service Commission only to discover that he had built his house in an unassigned area. Despite the previous promises from GTE, the Michigan Public Service Commission noted that legally GTE could not be forced to provide service in that area. Professor Ron Choura from Michigan State University’s Telecommunications program worked at the Michigan Public Service Commission at the time. He connected with Reigle, and the two hatched a plan to create a brand new telephone company. Commuting hours each way, Reigle took classes from Professor Choura in order to implement the idea. By late 2003, they had put together a business plan for a nonprofit telephone company and incorporated it with the state. Reigle and Choura did what no one had done in more than 20 years: they created a brand new Incumbent Local Exchange Carrier (ILEC). Telephone companies are either ILECs or Competitive Local Exchange Carriers (CLECs). A key difference between the two is that ILECs may receive funding from the federal Universal Service Fund, which is distributed to subsidize connectivity in rural communities. When the federal government created the system to regulate telephone companies in the 1980s, they assumed that all ILECs would be created at one time: the entire U.S. was carved up into non-overlapping areas for the telephone companies. Any telephone company created after that would have to compete with the incumbents. Up to now, the federal government only had a process for approving new competitive telephone carriers; creating a new incumbent was an entirely new procedure. The Federal Government required Choura and Reigle to obtain many waivers in order to qualify as an ILEC and receive Universal Service Funds. Allband Communications was not only going to be a new ILEC, also a new utility cooperative, which put it under the purview of the United States Department of Agriculture. As a cooperative, Allband Communications could receive funding from the United States Department of Agriculture. Most utility cooperatives were created during the 1930s for electricity and during the 1950s for telephone service. An increasing number of telephone and electric cooperatives are providing high-speed, Fiber-to-the-Home (FTTH) service throughout the U.S., but have the benefit of decades of experience in providing utility services to their local community. Without that past experience and community trust, Allband Communications' venture seemed a bit more risky, but the cooperative had community support from folks who wanted reliable 911 service. Allband Communications received some seed money from a LinkMichigan grant of about $212,000. The grants were awarded in the early 2000s to help spur telecommunications planning and deployment. In August 2004, the cooperative also submitted a loan application to the USDA Rural Development office. While they waited for that application, they began to build an all fiber network with $6.24 million in RUS funding. At that point, the cooperative was still waiting on several waivers from the FCC in order to receive its ILEC status. Finally, the FCC approved several of the waivers in 2005, and the USDA Rural Development Program officially awarded about $8 million to the cooperative to start its project. It didn’t take long for Allband to build out its network, which began providing service to its first cooperative member in November 2006. Within a month, the FCC approved the remaining waivers to make Allband an official ILEC. Allband was then able to join the National Exchange Carrier Association, saving money on administrative expenses, keeping costs down, and start receiving Universal Service Funds. In August 2010, the co-op received an American Reinvestment and Recovery Act (ARRA) grant of $9.7 million to build out their network further into underserved areas. Check out their service area map which covers and area of around 3,600 people. Allband Communications Cooperative continues to focus on the current needs of the community. The cooperative’s latest projects include expanding the fiber network, improving small business efficiency, and increasing home safety. The network expansion extends into the new “Allband Multimedia area,” which is outside of Allband Communications original cooperative area. In order to encourage digital inclusion, Allband is offering credit for construction of the network. Those within the cooperative’s footprint who have not yet connected are eligible for a $1,000 credit to put towards extending the cable to their house. Those in the “Allband Multimedia area” can get a $500 credit. The goal is to make the expansion of the network affordable for the community. Allband Communications is not just expanding their network into new areas, but also into the office sector. The co-op launched Unifi, a way to seamlessly connect office devices, enabling telephone calls to be taken on cellphones, laptops, or tablets. The Unifi program also includes features like screen-sharing and video conferencing. At the same time, Allband Communications has launched LifeWatch, a live-feed video monitoring system that can be used for everything from home security to caring for elderly relatives. They've set up the LifeWatch system on their website, which features a feed of local wildlife from the Allband facility backyard. The goal of Allband Communications has always been to improve the community by providing much needed connectivity to their neighbors. The service territory is in an economically distressed and historically underserved area of northeastern Michigan. Allband brought reliable 911 service to the community in addition to telephone and fast, affordable, reliable Internet access. Stand alone residential Internet access is available at 100 Mbps download and 50 Mbps upload for $59.99 per month. There are not data caps and subscribers can also bundle with voice services. The cooperative not only provides home Internet service, but also connects community anchor institutions, such as government facilities, libraries, or schools for free or reduced rates. Allband Communications is providing much needed connectivity to local churches: Beaver Lake Community Church, Calvary Baptist Church, and Spratt United Methodist Church. Allband is donating connections of 100 Mbps to the churches. Allband communications has also started a nonprofit called Allband Communications Education, Wildlife, & Research Opportunities (ACEWR) that provides educational opportunities, workforce development, and wildlife research. ACEWR allows the cooperative to collaborate with universities and research institutions across the United States. The nonprofit also has an online workforce development program to train locals in new skills, empowering them to succeed in the 21st century economy. ACEWR’s location in the Michigan woods also makes it a prime spot for research on local wildlife, endangered species, and conservation projects. 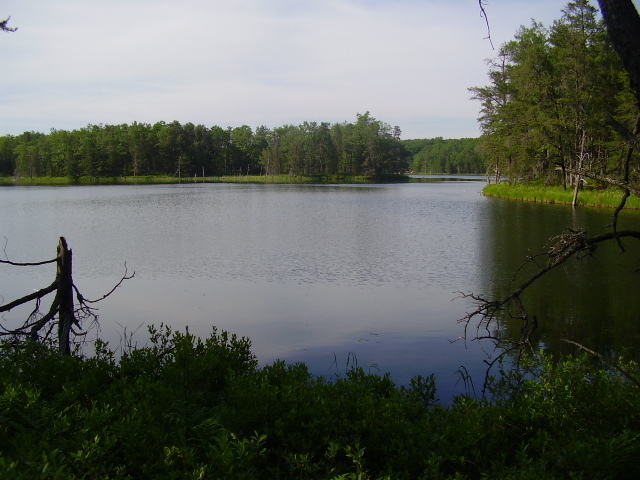 Picture of Carnberry Lake in Curran, Michigan, courtesy of Homes.com.